We are a family run business with over 30 years experience. So this means you will always see the same faces when you visit us and be offered a warm welcome. Our passion is to offer a good service and knowledge to help and advise you to keep your very own aquarium at home or a workplace. Fishkeeping is a very peaceful and rewarding hobby. We cater for the beginner to extreme hobbyist. Our fish come in weekly, often handpicked by us to insure quality and a varied selection. If you have a certain request for livestock or dry goods please contact us and we will try our best to get it for you. We have a livestock list on our website which is updated weekly. We are easy to reach from the A27 or the A259 Brighton Road (Seafront Road) there is free easy parking outside our shop and in the surrounding roads. Open Tues-Sat 10:00-5:00 Wed 2:00-8:00, Sun&Mon CLOSED. 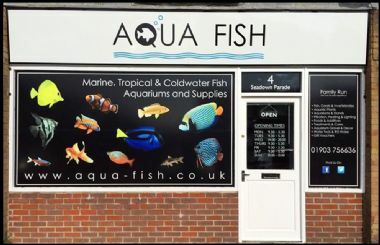 Find us at 4 Seadown Parade, Bowness Avenue, Sompting, BN15 9TP 01903 756636.